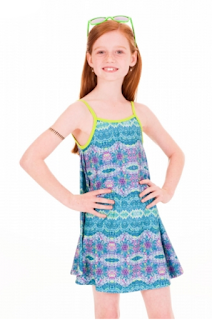 Mommy's Favorite Things: Limeapple Swim for Preteens! I did a review on Limeapple's activewear last year and this year I got to try out the swimwear. They had so many adorable styles, it was hard to narrow it down to one. But my daughter and I settled on this really pretty blue swimsuit. It's no longer on the website, but they have a black multicolor that's identical. Avery really loves her new suit and it fits her perfectly. We got the size 8 (she'll be 9 in May) because I didn't want the 10 to be too big since she's on the smaller side, and it fits her well. She loves that the top looks like mermaid scales! Even though it's a bikini it still has good coverage, the top has a wide band at the bottom and the bottoms cover everything they need too, so it isn't skimpy at all. But if you're worried about that, they offer 1 pieces and coverups as well. Price: Most suits are on sale right now! The multicolor that's like the one we received is $43 (isn't on sale) the pink one piece above is just $25. Overall: ***** perfect swimsuit for this summer! These are really cute swimsuits for Summer! I like the styles and how well made they are. I will have to check out the site! Really cute. Checked out their site, and they offer lots of styles. I like the cuts and fun prints. Such a super adorable suit!